My first question after hearing a demo of Mass Fidelity’s Core wireless speaker in September was, “have you thought about building a subwoofer?” At the time, CEO Ben Webster said he was focused on kicking off a modest $48,000 crowd-funding campaign and getting the Core speaker into production (he’d already secured independent funding to pay for the initial tooling). After blowing past that goal—the Indiegogo campaign has raised more than $718,000 to date—Mass Fidelity decided to go ahead and build that subwoofer. Mass Fidelity says its Core Wireless Sub won't perform the wave field synthesis its Core speaker promises because such spatialization techniques are unnecessary for omnidirectional bass frequencies. Don't get me wrong. I wasn't disappointed with the Core's bass response. But a little extra oomph on the low end never hurts. The Core Sub will connect wirelessly to a Core speaker and has range of up to 100 feet, although Mass Fidelity’s press release qualifies that by saying “20- to 30 feet is ideal.” If the Sub is placed outside the Core’s range, the Core resumes handling bass and the Sub goes to sleep. The Sub will not be capable of operating on battery power and must remain plugged into an AC outlet. The Core Sub is available for preorder now for $229. Backers can also preorder a Core Wireless Speaker with a Core Sub for $618. 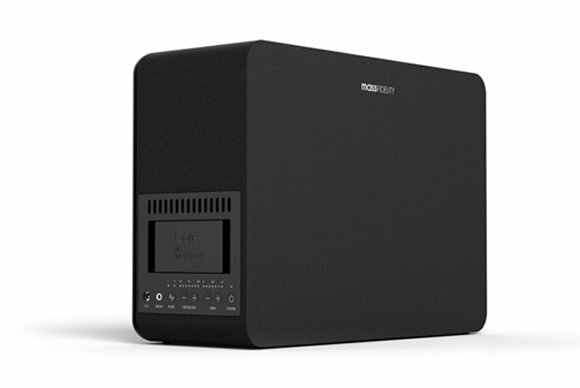 Mass Fidelity indicates a Core speaker on its own delivers frequency response of 44Hz to 20kHz. When paired with a Core Sub, the bottom end of that frequency response drops to 35Hz, with the sub handling frequencies ranging from 35- to 120Hz. Controls on the Core Sub’s cabinet will enable users to fine-tune its crossover, gain, and phase control settings to their preference. The Core Sub will be equipped with an ARM Core processor for configuration and to run Mass Fidelity’s multi-room operation software, two DSPs to handle signal processing and equalization, and a Class D amplifier (although the company has not released a power rating for the amp). The Core Sub is available for preorder now for $229. 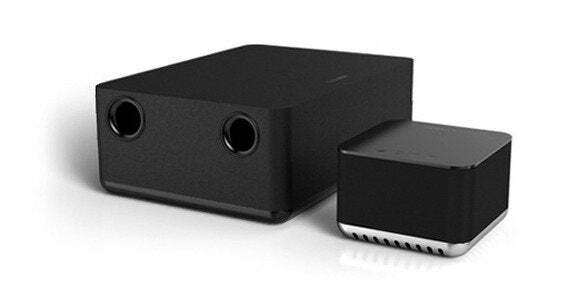 Backers can also preorder a Core Speaker with a Core Sub for $618. Following the completion of its Indiegogo campaign, which has been extended to November 2, Mass Fidelity expects to sell the Core for $599 and the Core Sub for $399. The Core Wireless Speaker is expected to be available in March 2015, with the Core Wireless Sub shipping in June, 2015. Update: I just received some additional information about the Core Sub: Mass Fidelity tells me their proprietary wireless network can support up to eight wireless devices. It can therefore support four Cores and four Core Subs. But if you decide to add additional Cores, you can hard-wire subwoofers to the Cores to get around that eight-device network limit. In other words, you could have as many as eight Cores and eight Core Subs, as long as the subs are hard-wired to the Cores. I've also learned that while the Core Sub is currently envisioned as having a ported enclosure, but that could change once the company builds and tests a prototype. The company declined to provide a power specification for the sub's amplifier, since the design might change. What do you think of the Core and the Core Sub? How will Mass Fidelity fare competing with the likes of Sonos? Are you participating in the company's Indiegogo campaign? Let us know in the comments section, below.